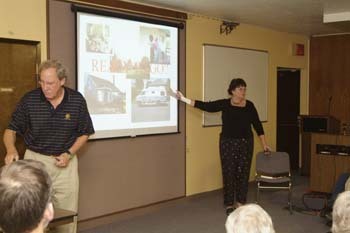 Phil and Carol White do presentations for various groups and on radio and TV. Below is their schedule of upcoming appearances, and archived radio broadcasts you can listen to on the web. Phil and Carol are no longer doing live appearances, but are always happy to answer your individual questions; Please email or call them � see the contact section for further information. Topic covered were traveling in North America, travel writing, and what it takes to publish your own book plus user questions. May 7th Transcript coming soon. Radio Interview: "What's Your Story"
BlogTalk Radio, the number one radio social network on the Internet. May 4th The archived segment of Carol and Phil's interview can be heard here. The online video posting of Carol and Phil's interview is available please see instructions below for accessing it. Visit here >> then Simply click on the third tab over "Travel" and select March 20 2008 date. Jan. 2, 2007 Click here to listen to Podcast. Feb. 19, 2006 Each week Michael Dixon and Louie Thiele present a variety of travel choices from African safaris in Kenya, to hidden weekend adventures in Arizona. Last minute deals, vacations of a lifetime, and the best airline fares from Tom Parsons make The Travel Planner a must for everyone. Weekdays, Noon - 1 p.m.
KERA 90.1's award-winning host Glenn Mitchell moderates a live (and lively) forum and open dialogue between diverse guests from all walks of life and phone-in callers interested in expressing their own views on the topics of the day. Cable Radio Network, Langer Broadcasting and Armed Forces Radio. Gary Trust host of "New England Lifestyles"
(Crawford Broadcasting Network) & is rebroadcast at other times during the week. Also on KSIV (Bott Radio Network) Saturday mornings. WLPO - "On the weekend"
Live Your Road Trip Dream: Travel For A Year For The Cost Staying Home. "The hour journey around the world"
3. If you do not have Real Audio/WinAmp or Windows media software, links are provided for free download. 4. The computer needs to have either internal or external speakers.